Reporting is an import part of almost any web-oriented application. A couple of ways is used to deliver reports to the end user. They vary from simple csv (coma separated values) file generation to expensive complex reporting solutions, such as Crystal Reports. Choosing the optimal solution you should pay attention to such aspects as solution price, ability for end-user editing of the template, ease of use for target audience, etc. One of such ways, delivering relatively cheap reporting solution with end-user editable templates is using WordML. As you can see, it's simple XML document with custom namespace. So what's this all about? XML support in Word 2003 gives the end-user ability to add custom tags (and namespaces) to the document without corrupting its structure. This in its turn is useful for getting data from Word file and for custom transformation (using XSLT for example). In this tutorial we will use XPath, ASP.NET 2.0 and WordML to create reporting solution from scratch. The first step is to define query we will use in our report. They're pretty straightforward. 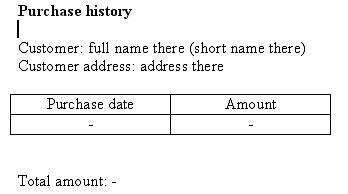 We will just select one customer record along with amount of purchases and all rows related to this customer from Purchases table. This example is fair simple. We simply load all data to DataSet and then add a relation between Customer table and Purchases table in the DataSet. Please remember LoadData function which we will use later as well. After that we simply output the data to XML file. It's an intermediate file and we need it only to create matching XSD file. In order to make Word generate XSD file for us - we will use Word Xml Toolbox, which should be downloaded from Microsoft site and installed. Now we can try to open our XML file using word. We will see nothing special - just XML structure and data. 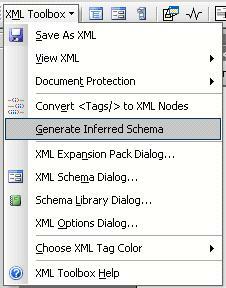 Our goal is to create XSD file now and it can be achieved by clicking "Generate Inferred Schema" From XML Toolbox menu (see image below). In appeared dialog you should provide namespace for the schema (you can leave Root node as is). This namespace we will use later in our application. Let's make namespace be "test-customers". Enter the path to XSD file and click "Generate Schema" button. A new document with attached XSD will be opened. Now we can start creating our report template. You start by writing text, applying styles and formatting and so on and leaving space for the text to be inserted. In our case we will create document with simple header (Customer info), footer (total amount of all purchases) and a table containing purchase details. You should remember that each customer has several purchases he made - so we will need to create some sort of the ASP.NET repeater control, which will iterate through purchases and print each one in a row. As you can see later it's really easy with WordML and XPath. With "full name there", "short name there", "address there" and "-" signs we mark the position where we will put details from our database. Now we should place our custom XML tags in the document. You should select desired area (area that will be later replace from our custom data, in this case it's "full name there", "short name there" and so on). Then in right-click menu you should see "Apply XML tag" and a list of all fields from your XML schema. If you look at our queries and generated XML and XSD file you will notice that each tag in both files represent exact field from our tables. So, for example, if we have a field called SHORT_NAME then we will have a matching tag <SHORT_NAME> in XML file and matching element in XSD file. So you just need to place respective tags of the customer in the document. The next step - is to provide design area for purchase details output. As you remember each customer has many purchases, so we will need to repeat table rows for each purchase. You just need to mark the entire row and then apply "Purchases" (or "CustomerPurchases") tag to the whole row. Once you get in the row cell you will see that a list of available tags has changed - now you can see tags, belonging to Purchases table. Place them in respective cells, save document in XML format (setting ignore schema errors tick box) and consider we're done with the template. Now we can manipulate our WordML document. You don't need to know much about WordML schema and tags used by Word - we will use relative paths to select our XML nodes. The basic idea is to iterate through columns in Customer DataSet, find matching tags in WordML (don't forget that our custom tags has names exactly matching columns in our DataSet), and place data inside of this tags. The first to things to do â€“ is to define namespace manager, which will resolve our tags (because they have their own namespace) and create XmlDocument instance. As you can see we register two namespaces within manager. The first one is WordML native namespace - second is ours. As you should know - each namespace has its URI and prefix. In this case WordML namespace should always have "w" prefix, while custom namespaces may vary. You should check the beginning of our XML template to find what prefix is used for our "test-customer" namespace (just try to search for "test-customer" string in the file, while it's opened in FireFox or any other browser). If we found only 1 row in resulting table - then we will add data to custom tags only once, in case there are may records in table we will clone XML nodes and insert one before another, filling each with data. If you look at our template you will find that w:t node is inside w:r, which in turn can be place insite w:p (paragraph) node. That's why we use conditional XPath expression (| symbol denotes OR condition on two XPath expressions). Now it's a half done. All we need now is to create a similar routine for data tables that have several rows(processRepeatingRows). It's a bit complex rather that processSingleRow method. First of all we find a template row. Once we're done with all the rows in data table we can simply remove our template row (node) from the document as we don't want unnecessary empty rows in our purchases table. It's pretty easy and rather good-looking. Sample Visual Studio 2005 project for this tutorial you can download here. The only drawback of using WordML as templating solution is that it requires MS Word 2003 to be instaled at your user's computer (it don't need to be installed on server).